High performance Entrance Matting (also known as ‘Barrier Matting’) is designed to effectively remove and retain soil and moisture and prevent its ingress into a building via pedestrian and wheeled traffic. 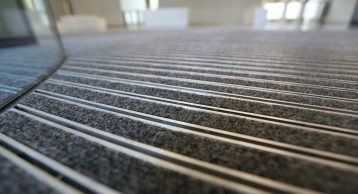 Occupying a prime position in every building, Entrance Matting is a key area for creativity, forming a unique first and last impression for every visitor. 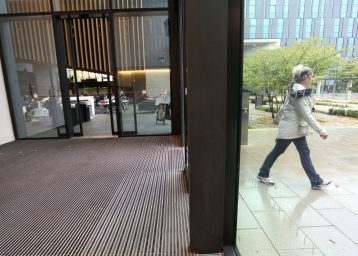 Working with architects and interior designers, INTRAmatting has created bespoke solutions that truly befit the building design, making the entrance distinctive and even iconic. From the germination of an idea to meticulous implementation, attention to detail and uncompromising performance remains paramount. 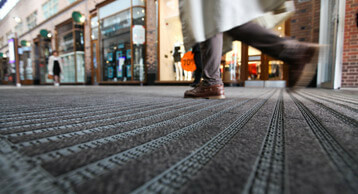 Whether you need ribbed matting, drainable support systems or built in entrance carpet, INTRAmatting can help. First impressions last! What does your reception say about your company and it’s services? 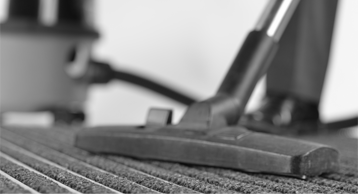 The safest and most effective surface mounted Entrance Matting solution for retro-fit applications, providing a safe and viable alternative to traditional loose lay matting options. 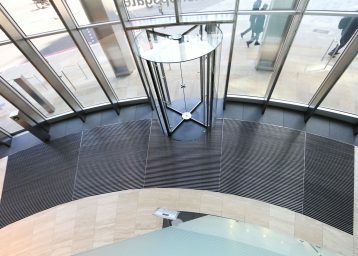 The INTRAmatting brand of Entrance Matting is a unique range of products that combine up-to-date design and aesthetics with the ability to suit the most demanding environments. 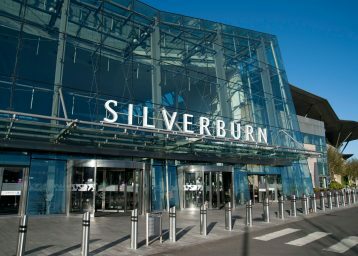 They have been designed by industry specialists with an intimate knowledge of the entrance and barrier matting marketplace and provide optimum performance, every time. Using innovative design creation, modern engineering methods, and scrupulous testing procedures, ideas become reality. 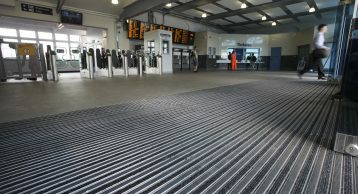 INTRAsystems has extensive experience specifying and installing Heavy Duty Commercial Entrance Matting in all market sectors, with an impressive portfolio of clients built up over the past 38 years. With every environment requiring individual attention to detail, experience and market knowledge is paramount to ensure optimum performance, every time. 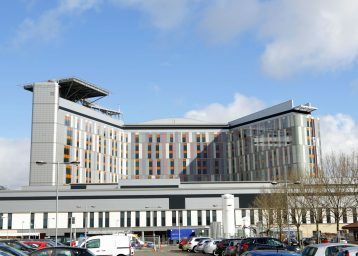 Successfully delivering a vital element of an iconic project is a responsibility and a privilege. Working with acclaimed designers, architects and construction teams from around the world, our work is thoroughly rewarding! 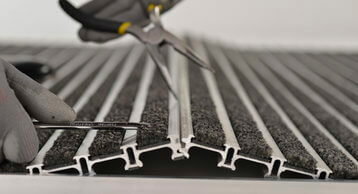 The key to a successful Entrance Matting installation is the right product with the right design. 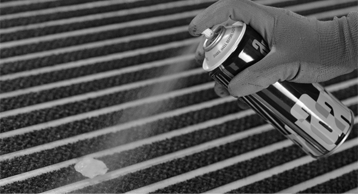 Appropriate use of the Intramatting products will ensure maximum dirt and moisture removal to protect your internal floor coverings and reduce your cleaning costs, while enhancing your entranceway with the matting’s aesthetic appeal. 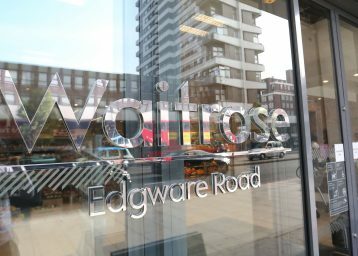 INTRAsystems has extensive experience specifying and installing Heavy Duty Entrance Matting in all market sectors, with an impressive portfolio of clients built up over the past 38 years. With every environment requiring individual attention to detail, experience and market knowledge is paramount to ensure optimum performance, every time. INTRAsystems has an undeviating commitment to act responsibly in care of the environment. 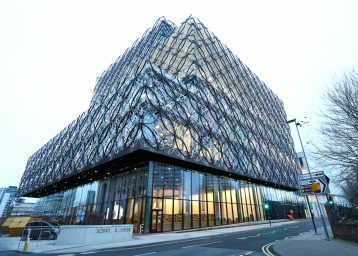 Working on key projects throughout the UK and Europe, the company is familiar with all environmental ratings such as BREEAM and WRAP and help clients achieve, and exceed, their sustainability goals. All production is in accordance with the Waste Management Act, with the goal to ‘reduce production of waste and their harmful effects.’ Critical processes are continually monitored to ensure minimum negative impact: The Axis House Environmental Sustainability Statement sets clear targets for ongoing improvement to ensure the company continues to lead in our increasingly aware society. A truly global brand, with specifiers and installers throughout Europe, Asia, North & South America, Australia and New Zealand.